Meredith/AP) – Whales are generally peaceful. Sharks are generally aggressive. So, what happens when there is a giant, sea-dwelling creature that embodies both massive beasts? Well, prepare to feel small. Whale sharks are the biggest fish in the sea. But unlike some of their ferocious cousins like the great white, whale sharks are gentle giants, harmful only to the tiny fish and plankton they eat. They weigh up to about 40,000 pounds and typically grow between twenty to fifty-two feet. That’s bigger than a double-decker bus. But these majestic creatures are vulnerable. Overfishing is putting them at risk of extinction before scientists are even able to understand them. “So this whole portions of the population that we don’t really have much access to so scientists or several scientists have often referred to them as a kind of a mystery species,” says principal scientist Alex Hearn with San Francisco University of Quito. Mostly young males are found in numerous warm water locations, but a group of biologists noticed something special about the Galapagos islands. “The Galapagos marine reserve is a fantastic place as a scientist, it’s the cradle of evolution. And it’s one of the last remaining bastions of those huge schools of hammerhead sharks, you know it’s a healthy marine ecosystem. And it’s also highly variable,” says Hearn. Knowing more about these females will help piece together missing parts of the species’ life cycle. Researchers tagged several sharks in the Galapagos with trackers to figure out where the females are going. When they look at shark locations with water temperature data, they discover something interesting. In the vast open ocean, the sharks are moving entirely between two areas where warm and cold water meet. Areas like these are where a marine pattern called upwelling takes place. Strong winds blow warm surface water along the equator driving colder, nutrient-rich water to the surface from below. These areas are good places for whale sharks to feed, but some scientists don’t believe that’s why they are following the upwelling. “If there was a food source they would have thought that they’d be spending a lot longer. You would have thought that you’d see them feeding. So that’s not happening, ” says Hearn. The sharks could be traveling to these areas to give birth far away from potential predators, but nobody is completely sure. 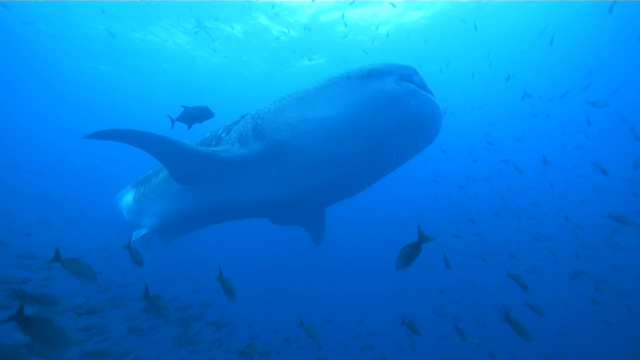 Whale sharks move fast and dive deep. It isn’t long before many of the trackers drop off, making it difficult to collect enough data to confirm the sharks’ exact behavior. But with the data they are able to collect, scientists discovered a recurring seasonal travel pattern performed by pregnant female whale sharks, a previously underreported subset of the whale shark population. Knowing where the pregnant females are traveling could yield a wealth of information tied to the whale shark’s early life and its precious habitats. Getting scientists one step closer to understanding the life cycle of this mysterious animal. “It is really important to understand the movements the migratory patterns of these species if we wish to protect them in a meaningful way,” says Hearn.